It’s been a while since I’ve done one of these spotlights but this one will break that mould nicely as its such an amazing enterprise and one that is extremely important in where we are with the environment. 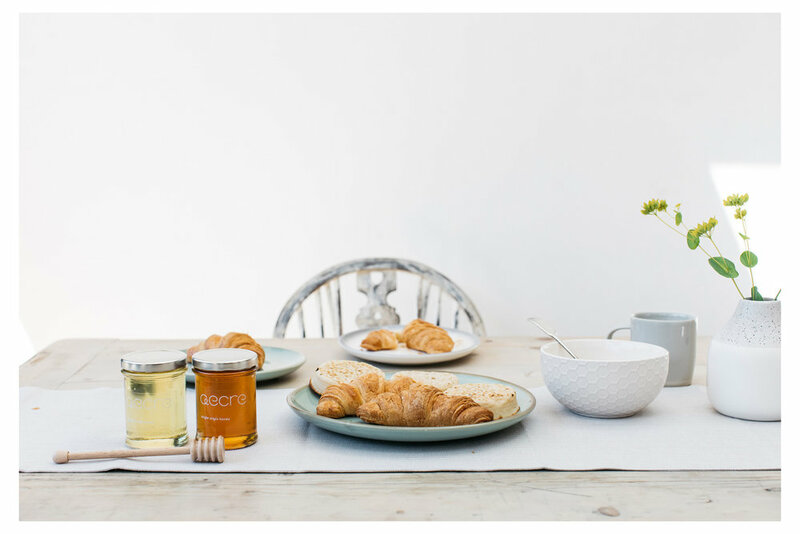 Earlier this year I met with Adam Strawson about photography for the relaunch of his honey company (formerly The Brighton Bee Co) and I was so struck by his passion, knowledge and respect for the team he was putting together. It was such an honour to be part of the relaunch journey with Adam and a few months ago the new Aecre site launched. 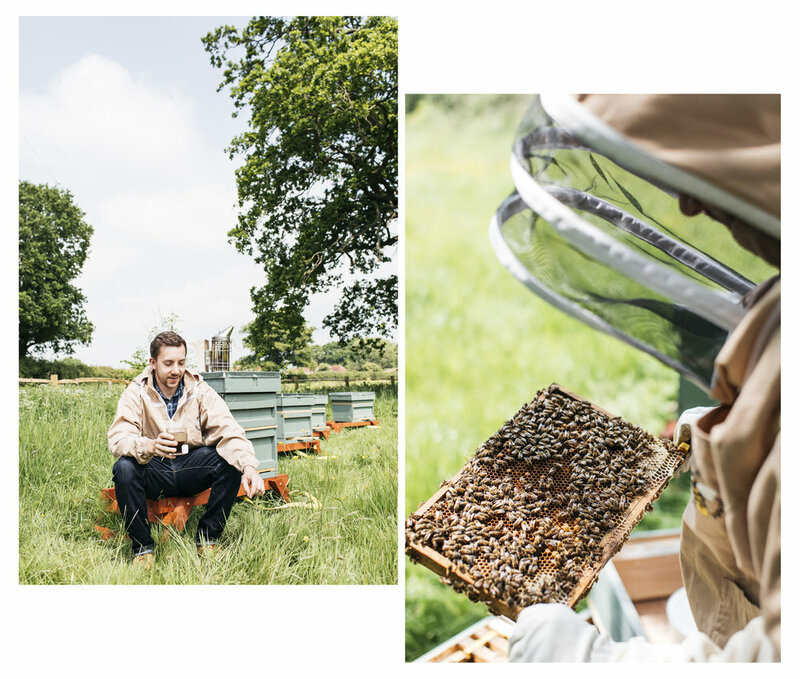 Each time I worked with Adam his passion for beekeeping never wavered and it’s infectious! Adam always had a keen interest in beekeeping and had kept bees in his back garden in his spare time from his previous job as a software engineer. He soon moved onto a bigger patch on some land rented from a local farmer and but noted the honey tasted different and looked a slightly different colour. Adam’s interest was piqued by these flavour profiles and the idea of Aecre was born. Aecre is essentially a honey cooperative - Adam works with local beekeepers and sells their raw, single origin honey under the Aecre brand. He plans to grow his roster of beekeepers and sell their gorgeous honey through his website. Additionally, Adam is offering no strings attached grants to those who have projects aiming to benefit the environment, that can be applied for here. What a guy! The honeys you buy (even local ones) can be blended from different apiaries whereas single origin honey comes from one single apiary/beekeeper. The taste depends on what is local to the bees and what the bees are collecting. For instance, the Brighton Aecre honey has a subtle taste which suggests that the bees from that particular apiary have been collecting nectar from nearby linden trees but next year it might be completely different if the bees collect from different sources. There are many reasons to invest in a good quality honey - the commercial ones you buy in shops are blended from all over the place and may also contain fructose syrup (that’s not a good thing!). Local honey contains local pollens and by eating these you are essentially building your immune system up again local infections and pollen allergies. Also, you are ensuring small, ethical beekeepers are able to do the great work they do as well as knowing your honey isn’t adding to food miles and is also help preserving our very important bee communities. Honey that goes through a pasteurisation and heating process also has a lot of the goodness removed, reducing it to essentially just a natural sweetener. Raw, untreated honey never goes off, is anti viral, anti bacterial, anti inflammatory and promotes wound healing - among many other benefits. As well as eating it you can try is in a face mask or have in tea instead of sugar. At £6 a jar, Aecre is a competitive price but also ensures you are putting some good back into the environment and beekeeping community. We’ve had a lot of press on the importance of our bees so I won’t go back over it but we need people like Adam to continue doing their great work! Plus you get an unwavering quality of honey every single time. Plus the jars look really lovely with tea lights and plant cuttings in them! Buy your Aecre honey here.